Christopher Barnes, Paulo Brito, Eckhard Gerdes, Thomas Gresham, Colin James, Michael Leigh, Terri Lloyd, Samantha Memi, Frank Pulaski, Jason E. Rolfe, Merve Semsar, Doug Skinner. Franciszka Themerson. SPECIAL NEW YEAR ISSUE. Featuring Alphonse Allais, Paulo Brito, Pink Buddha, Simon Child, Norman Conquest, Eckhard Gerdes, Russell Helms, Harold Jaffe, Jan Vander Laenen, Terri Lloyd, Samantha Memi, Sheila Pell, Frank Pulaski, Ron Riekki, Stephen Silke, Doug Skinner, Madalina Tantareanu, Tom Whalen, & Carla M. Wilson. Gala holiday issue filled with glitter. Featuring a Christmas story by Alphonse Allais, and other cheerful works by Paulo Brito, Pink Buddha, Norman Conquest, Terri Lloyd, Frank Pulaski, Jason E. Rolfe, Doug Skinner, and Yuriy Tarnawsky. Frank Pulaski, Jason E. Rolfe, Erik Satie, Doug Skinner, and Ubu Trump. 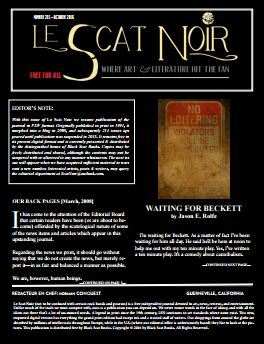 Inaugural e-zine edition. Featuring Paulo Brito, Norman Conquest, Paul Kavanagh, Jason E. Rolfe , and Doug Skinner. DESIRING TO CONTRIBUTE? CLICK HERE AND DOWNLOAD OUR GUIDELINES.